The nineteenth chapter of Luke tells of the triumphal entry of Jesus into Jerusalem. People everywhere were shouting and singing “Hosanna” and waving palm branches in excitement and adoration of their Messiah. In verse 39, some of the Pharisees demanded that Jesus rebuke these people for making such a fuss. In verse 40, Jesus responds that if they were silent, the stones themselves would cry out. Wouldn’t that just be utterly terrifying? You’re going through life, minding your own business, never praising God, and all of a sudden, the rocks on the ground starting yelling and singing. Not only are they yelling and singing but they’re shouting praises to God. As a worship leader, it can be hard to remove my ego and realize how truly irrelevant I am in praising God. Yes, it is my responsibility as a follower of Christ to glorify God and yes, it is my responsibility as a worship leader to utilize music to worship and lead others in worshiping God. But it’s plain right there in verse 40, if I don’t do it, someone else will, and if they don’t do it, the rocks themselves will cry out in praise and adoration of our great God. God will be praised. God will be glorified. The fact of the matter is: I’m replaceable, and that is a good and wonderful thing. Don’t get me wrong, I still want to use music to glorify God and lead others in worship but the realization that I’m easily replaceable, that God will be praised regardless of what I do, helps me to keep the most important aspect of worship in check: it is completely and entirely never about me or you. Ever. Does ego get in the way sometimes? Absolutely it does. Even worship leaders and Pastors are fallible. But if I can’t work past that ego, then I’m in this for all the wrong reasons and need to get out of God’s way. We reach a dangerous point when we let ego step in and make worship more about our desires and our preferences than the reason we are worshiping in the first place. We reach an equally dangerous point when we constantly criticize another person’s preference of worship just because it doesn’t fit into the mold of what we think is best. When we allow that to happen, the only rocks that won’t be praising God are the rocks that were once the hearts beating in our chest. God is expansive and beautiful and worthy of all the types of praise and worship that we can muster. Praise God with all you can. Don’t let ego get in the way and don’t let the rocks do your job. I just love this song. We’re doing it this week in worship at Keller so it’s in the forefront of my mind and I felt like sharing it. I was introduced to the music of Mark Miller 5 years ago. I was immediately captivated by his way of capturing powerful text and setting it so simply and beautifully to music. I had the privilege of meeting and working with him a little over 2 years ago for the first time. Since then, I’ve been able to work with and correspond with him on occasion. In that time, he and his music have shaped my philosophy on ministry and music as well as the church’s responsibility in regards to social justice. You can listen to a better recording here but there is no video. It’s not a typo. The semicolon is supposed to be there but we’ll talk a little bit more about that later. Two years ago, I made a series of bad decisions. Some of the worst decisions I’ve ever made all in one night. Those bad decisions were the product of a time in my life when I was experiencing deep depression. The last bad decision I made that night was to harm myself on my left forearm. It’s not in my nature but depression can make you do things that you never thought possible of yourself. I was ashamed. I had allowed my brokenness, my weakness to control me. I sank further into depression. I drank more. This time as I sat there depressed and broken reading this passage of scripture, the words sank in and I wept. How could Christ’s grace be sufficient for what I did? How could power come out of such a great weakness, nonetheless be perfected by it? It couldn’t in my mind yet there it was in black and white. Paul didn’t mince words, he wasn’t talking in coded circles, he was explicit. It took me some time to accept it. It took me longer to even think about boasting. I wrote about it several months later for the first time. It was hard. It hurt some people, it helped some people. After that, the whole thing became taboo to me. I didn’t talk about it and I didn’t want new acquaintances and friends to know about it. It was as if it had never happened. I’m not regularly depressed but I’m going to admit, I do get depressed sometimes. Every so often, I become overwhelmingly and inexplicably sad. But I’m a lot better now; in some ways I’m better than I’ve ever been before. 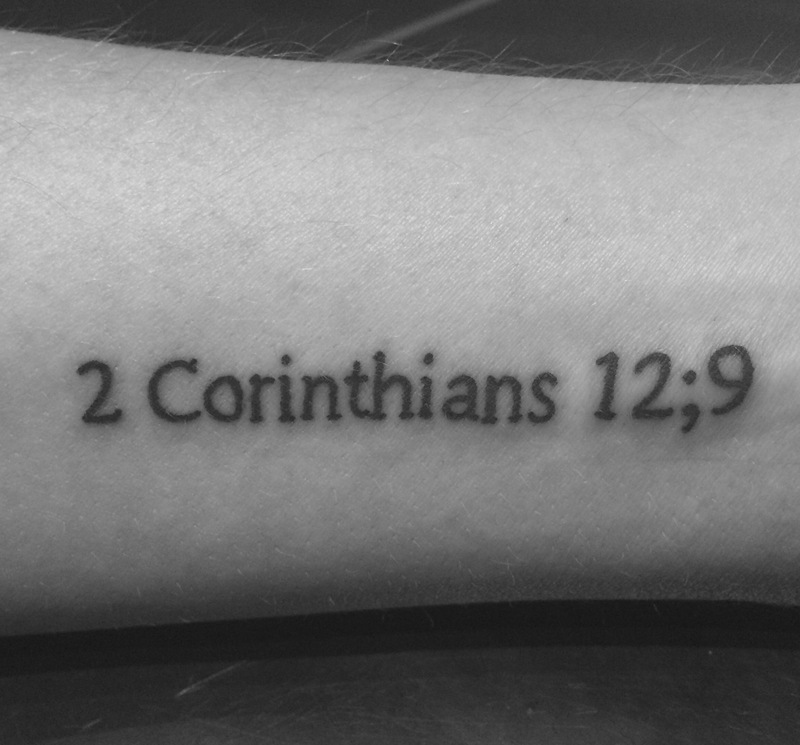 The turning point was what 2 Corinthians 12 did for my faith. Everyone always seems to have it all together in church, good on them if they actually do, but having it all together is not grace; that isn’t Christ’s power working in us. Christ’s power is never better displayed than in our weakness. It’s right there in verse 9. Why do we hide it? Why do we, in essence, flee the perfect, redemptive love and grace of our Creator and Savior? For me, it was pride. I couldn’t admit problems because that’s not who I was. I had it all together. I don’t have it all together and that is okay. I want to boast about my Savior’s power to the world. I want to scream it even though I have found that screaming, “JESUS LOVES YOU” at people is one of the worst and most ineffective forms of evangelism. BUT HE DOES LOVE YOU AND I STILL WANT TO SCREAM IT. I’m not going to scream it. I’m going to find ways to display Christ’s power through my weakness. One way I’m going to do it is through my newest tattoo. Project Semicolon was founded to be a way to spread hope and love for those who are or have struggled with depression, self-harm, suicide, mental illness, and addiction. You can read more about it by clicking above but the basis is to get a semicolon tattoo as a statement that my life isn’t over yet, the same way a semicolon works in a sentence. Christ’s power is made perfect in my weaknesses. I will boast about my weaknesses so that His power may reside in me and give me the ability to show that power with others. Preserve me, O God, for I take refuge in You. I said to the LORD, ‘You are my Lord, I have no good besides You’…You will make known to me the path of life; in Your presence is fullness of joy, in Your right hand there are pleasures forevermore. Psalm 16 is one of favorite chapters in Psalms. The NASB translation titles it “The LORD, the Psalmist’s Portion in Life and Deliverer in Death.” What an incredible reflection during Lent. God took on flesh and became Christ to be our physical portion in life and to deliver us from our certain death. And for that, I give all thanks, glory, and honor to God. Party primaries and caucuses are happening. The Super Bowl was a few days ago. Mardi Gras was yesterday. Beyonce stayed in an AirBNB house. Valentine’s Day is this weekend but more importantly (depending on who you ask) so is College Night. There’s a lot happening in the world right now, as if there is ever a time “a lot” isn’t happening. You might not have noticed, unless you partook in the Mardi Gras (or Shrove Tuesday) celebrations but Ash Wednesday is today. Ash Wednesday is the beginning of Lent, which is my favorite liturgical season. Maybe we aren’t supposed to have favorites but I don’t care, Lent is my favorite. It might be odd that it’s my favorite because it’s such a solemn, almost melancholic at times, season but that’s precisely why it is my favorite. Forty days of solemnity and reflection on the life of a man, God in the flesh, born for the sole purpose of death. A death that would have unfathomable effects on the entirety of mankind. I can’t fully wrap my mind around it but then again, I don’t think I’m supposed to be able to do so, I’m just grateful for it. This song by The Brilliance is a simple prayer. 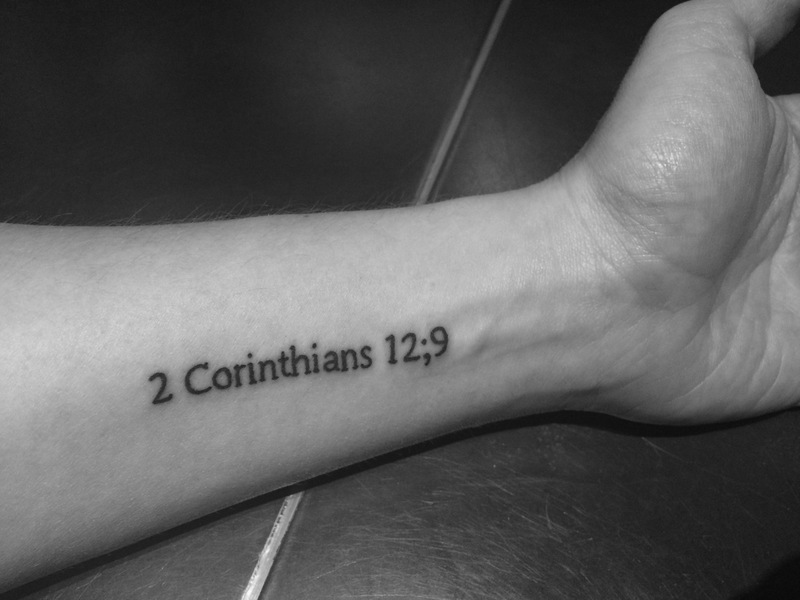 I like that it addresses God as the Spirit, the Father, and the Son. I like that it asks for peace, forgiveness, and our rescue. It’s simple and yet so meaningful. That’s Lent. Simple yet meaningful. Simple in that all it takes is us recognizing our own brokenness, our own need for a Savior and meaningful in the realization that Christ fills that brokenness as our Savior. He does it now, he does it at the hour of our death, and he does it during all the time in between. Repent and believe the Gospel of Jesus Christ. This isn’t a worship song. If you didn’t know that, you don’t know who The Beatles are and if you don’t know who The Beatles are, I don’t know what to do for you. A few weeks ago, Spotify released the complete discography of one my all-time favorite musical groups and one of the greatest bands of the 20th Century. I was ecstatic as it’s always been a disappointment that Spotify didn’t have but a handful of The Beatles’ songs available. It’s very uncommon that I listen to any music not related to Christmas during the month of December but I was very comfortable making this rare exception. I spent the week between Christmas and New Year’s with family in Alabama. Every time I go home, I take my nephews, Korban (7) and Lawson (4), out for the day; just the three of us. I had the distinct privilege of introducing them to the wonder that is The Beatles. As we drove around town listening to various hits and a few deep tracks, we kept coming back to one of my all-time favorites, “Hey Jude”. “Hey Jude” can be perceived spiritually in it’s own way, like much of The Beatles’ music. Paul McCartney said he wrote it for Julian Lennon while his parents, John and Cynthia, were going through a divorce and it’s message, at it’s most basic level, is essentially saying it gets better. I think that is very much a message that Christ wants the world to hear, it gets better. We played “Hey Jude” several times and I belted it out in the car with Korban and Lawson half-mouthing words they didn’t know. I thought it was cute they were trying to amuse their uncle. I didn’t think much more about it past that. A couple days after I was back in Texas, I get a text from my sister informing me that Korban insisted on downloading the song to his iPad. My sister was probably confused how he even knew the song but he insisted on having the song because we had listened to it and sang it together. I think we sometimes overlook the little ways we impact people. I never would’ve thought my nephew would remember the song nonetheless want to download it. I didn’t truly realize in that moment that I was creating a memory with him, I was potentially shaping how he felt about music and more importantly, how he possibly felt about me. I just thought I was playing a fun song for him, I didn’t realize that the moment would have any effect on him whatsoever. As we enter a new year that will be filled with ups and downs, steps forward and backward, big moments and small moments; I challenge myself, and you, to not overlook those small moments. Enjoy the small moments, then you can start to make it better.